Today in the Rose Garden, President Obama nominated James Comey as the next Director of the FBI. He is known for many other law enforcement highlights in his career: a role in taking down the Gambino crime family and trying to have the FBI pull back on the severity of interrogation tactics among others. In recent memory, he is best known for stopping Bush Administration aides from trying to get Attorney General John Ashcroft—who was in the hospital at the time—to sign off on a program that would let the government use wiretaps without requiring warrants. He cites the situation as “…probably the most difficult night of my professional life,” during his testimony to the Senate Judiciary Committee in 2007. 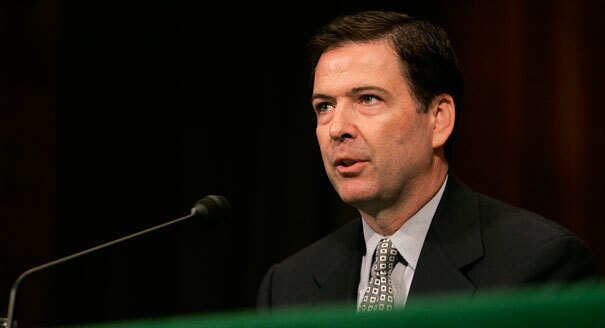 At the time Comey served as Deputy Attorney General in the U.S Department of Justice. Prior to taking the role of FBI Director today, Comey has served as executive at Lockheed Martin, lecturer on national security law at Columbia Law School, general counsel to Bridgewater, and a board member at HSBC Holdings. Comey would come in at a time when the FBI and national security agencies as a whole have been in the spotlight over the issue of balancing security and privacy and costs of each. Exiting is Robert Mueller who had been Director of the FBI since September 2001, just a week shy of the events of 9/11. Under Mueller’s leadership, the FBI was shaped into a heavy combatant of foreign terrorism while handling domestic issues. His work saw President Obama keep Mueller on two years after his original 10 year term. Earlier this week, Mueller revealed that drones had been used on U.S soil. Also under Mueller’s FBI, the agency combated cybert errorism, cyber scams, found the bombers in the Boston bombing, finding missing children, fugitives, and foiled an assassination plot on the President by domestic terrorists—just to name a few. The White House as well as the top Democrat and Republican of the Senate Judiciary Committee felt that James Comey is ready for the mantle, however the American Civil Liberties Union has its concerns. They mention that while Comey combated surveillance and interrogation tactics, he signed off on NSA, the indefinite detention of terror suspect Jose Padilla, and harsh interrogation tactics such as waterboarding among other red flags. Despite this, the White House is looking to Comey—a Republican—to easily make his way through the Senate confirmation process. Of James Comey, President Obama said that he “…understands, deeply in his core, the anguish of victims of crime—what they go through. He’s made it his life’s work to spare others that pain.” Also, he called Comey “…a rarity in Washington sometimes: He doesn’t care about politics.” He also praised Mueller for his time in the FBI and for having it adapt to various threats post-9/11. Robert Mueller leaves office September 4th. Should James Comey enter office, it would be for a 10 year term—far beyond President Obama’s second term.